I arrived at the Carpet Museum at 10am for the start of my work experience, not entirely sure what to expect. Amongst my first thoughts of the Museum was that, from the outside, the Museum could be better signposted as you do not see the signage until you enter Morrisons if you approach from the right h and side of the building. The Museum itself deserves to have every opportunity of advertisement as it is the sole Museum in Europe just about carpets and is inside a Grade 2 listed building. I was ushered into the building by one of the many friendly faced volunteers here that are the true heart of the Museum. Graham led me into the reception area with it’s astonishing views of the large hand looms that pumped out the carpets day in, day out. These looms I was told later are the only working looms in the Country and that I would be able to see them in action. I was met shortly after by Jodie, who is Collections and Archive Manager at the Museum and who would be my mentor for the week. I was given a brief tour of the Museum by Jodie and her passion and enthusiasm for the Museum was clear to see. After the tour I was taken up to the upper floors and given a tour. The Museum itself has a Tardis like feel to it and had many rooms I couldn’t wait to unlock. Such rooms as the Storage rooms which are temperature and Humidity controlled to aid conservation. We concluded are tour in the Staff room where I met Volunteers Mike, Colin, Jill, and Charles. As I stated before they are all charming and made me feel very welcome and a part of the team straight away. I spent a while in the staff room chatting and listening to Mike and Colin banter each other like brothers. I was then given the opportunity to explore the Museum for myself and I had the space all to myself as the Museum was closed for essen tial repair work. The floor space is limited but the Museum has not wasted any of it. 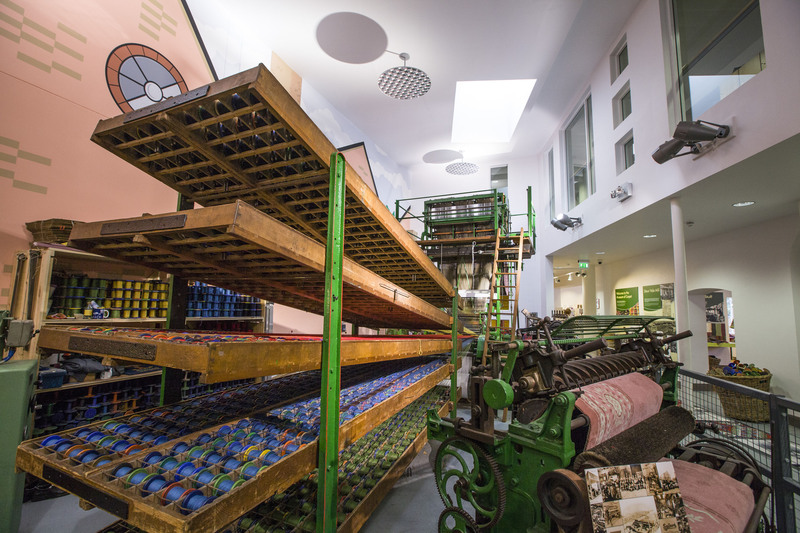 The space consists of four rooms, which are adjoining, and the factory floor space containing the Looms. The first room contains a hand loom and a spinning wheel, as well as a typical office space of the time with posters expressing the dangers of Anthrax, health and safety was not particularly important in those days. The other three rooms contain the History of Carpets in Kidderminster and how the Carpet Industry affected Kidderminster itself, even how the Kidderminster Carpet Industry aided the War effort, Video Logs on different subjects from the opinions of workers in the Industry, Detailed accounts on how the Carpets were tested for various defects and the complicated processes that made them, interactive displays and have a go yourself opportunities and many other sources of knowledge which I will not spoil for you. What I will say though is that the knowledge the Museum offers is vast and made me realise that, even though I have lived in Kidderminster my whole life, how little I know about my home town and its history. Did you know that Kidderminster started as a small town of 3000? The oldest carpet was found preserved in ice and dated to 5BC? And that popular phrases such as ‘not a thread of evidence’ comes from the carpet industry? Well until I came to the Museum I had no idea. After my eye opening tour of the Museum Jodie showed me the painstaking process of Categorising and storing all the artefacts. Again due to limited resources and lack of space this is an especially hard task for the Museum. Each object that the Museum has or obtains must be photographed, measured, given a detailed description and number and recorded on a database known as Calm. The wearing of gloves is essential during this process to avoid deterioration. Once the object has been Categorised and recorded the object must be carefully wrapped in acid free paper and usually bubble wrap before it is stored in the controlled room. Upon being shown the process by Jodie I was given the opportunity to categorise some objects of my own. The objects I categorised were paintings by Paula Woof of scenes inside a working Carpet Factory, done as part of an Artists in Residence scheme. The whole process fascinated me and was a real insight into the work and running of a Museum behind the exhibition spaces that the Public see. The categorising concluded my Day 1 and I left the Museum with a far better understanding of the Carpet Industry in Kidderminster, and the Carpet Industry itself, as well as valuable experience in the everyday running of a Museum. I keenly awaited what Day 2 would hold.